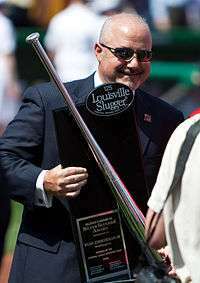 Washington Nationals general manager Mike Rizzo holds Ryan Zimmerman's Silver Slugger Award. The Silver Slugger Award is awarded annually to the best offensive player at each position in both the American League and the National League, as determined by the coaches and managers of Major League Baseball (MLB). These voters consider several offensive categories in selecting the winners, including batting average, slugging percentage, and on-base percentage, in addition to "coaches' and managers' general impressions of a player's overall offensive value". Managers and coaches are not permitted to vote for players on their own team. The Silver Slugger was first awarded in 1980 and is given by Hillerich & Bradsby, the manufacturer of Louisville Slugger bats. The award is a bat-shaped trophy, 3 feet (91 cm) tall, engraved with the names of each of the winners from the league and plated with sterling silver. The prize is presented to outfielders irrespective of their specific position. This means that it is possible for three left fielders, or any other combination of outfielders, to win the award in the same year, rather than one left fielder, one center fielder, and one right fielder. In addition, only National League pitchers receive a Silver Slugger Award; lineups in the American League usually include a designated hitter in place of the pitcher in the batting order, so the designated hitter receives the award instead. Embattled home run record-holder Barry Bonds won twelve Silver Slugger Awards in his career as an outfielder, the most of any player. He also won the award in five consecutive seasons twice in his career: from 1990 to 1994, and again from 2000 to 2004. Retired catcher Mike Piazza and former New York Yankees third baseman Alex Rodriguez are tied for second, with ten wins each. Rodriguez' awards are split between two positions; he won seven Silver Sluggers as a shortstop for the Seattle Mariners and Texas Rangers, and three with the Yankees as a third baseman. Wade Boggs leads third basemen with eight Silver Slugger Awards; Barry Larkin leads shortstops with nine. Other leaders include Ryne Sandberg (seven wins as a second baseman) and Mike Hampton (five wins as a pitcher). Todd Helton and Albert Pujols are tied for the most wins among first baseman with four, although Pujols has won two awards at other positions. David Ortiz has won seven awards at designated hitter position, the most at that position. "MLB Awards: History (Awards: Silver Slugger)". Major League Baseball. Retrieved March 9, 2009. 1 2 3 McCalvy, Adam (November 13, 2008). "Braun nets first Silver Slugger Award". Brewers.MLB.com. Retrieved March 9, 2009. ↑ "Louisville Slugger — The Silver Slugger Awards". Louisville Slugger. Retrieved March 9, 2009. ↑ "What are the Silver Bat and Silver Slugger Team Awards?". Louisville Slugger Museum and Factory. Retrieved April 15, 2009. 1 2 3 4 "Silver Slugger Award Winners — American League". Baseball-Reference.com. Retrieved March 9, 2009. 1 2 3 4 5 6 7 8 9 "Silver Slugger Award Winners — National League". Baseball-Reference.com. Retrieved March 9, 2009. ↑ "Official Rules: 6.00 The Batter". Major League Baseball. Retrieved March 9, 2009. ↑ "Embattled Bonds' urine sample tested positive, report". Google News. Agence France-Presse. February 3, 2009. Retrieved March 9, 2009. ↑ "Barry Bonds Statistics". Baseball-Reference.com. Retrieved March 9, 2009. ↑ "Alex Rodriguez Statistics". Baseball-Reference.com. Retrieved March 9, 2009. ↑ "Wade Boggs Statistics". Baseball-Reference.com. Retrieved March 9, 2009. ↑ "Barry Larkin Statistics". Baseball-Reference.com. Retrieved March 9, 2009. ↑ "Ryne Sandberg Statistics". Baseball-Reference.com. Retrieved March 9, 2009. ↑ "Mike Hampton Statistics". Baseball-Reference.com. Retrieved March 9, 2009. ↑ "Todd Helton Statistics". Baseball-Reference.com. Retrieved March 9, 2009. ↑ "Albert Pujols Statistics". Baseball-Reference.com. Retrieved November 11, 2010. ↑ "David Ortiz Statistics". Baseball-Reference.com. Retrieved March 9, 2009.